Steve Harris believes that the upcoming live album from his solo band British Lion will prove just how good they’ve become. They’ve just completed a run of tour dates and they’re planning to record the follow-up to their self-titled debut studio record, which was released in 2012. Before that they’ll launch a collection of live recordings made up of material from their most recent shows and possibly earlier appearances too. 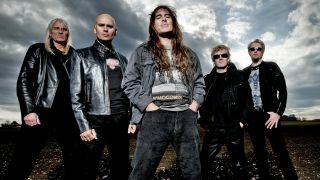 Harris, also of Iron Maiden, tells Overdrive: “We’re recording all the dates on this tour and we have a bunch of material from other shows in the past. While the first studio album was recorded in various locations over a long period of time, Harris says: “I think the next album will be recorded in one session. Despite being a busy man he remains positive about his commitments, reflecting: “I’m excited about getting back out there with British Lion for some more dates in the future.